At this time of year in Malawi the weather is hot and dry. Ideal bridge building time!. Earlier this year Neil Lilongwe, while visiting Malawi, saw while on route to Chiabalazi, outside Ekwendeni, a village bridge in need of major repair. On return to the UK funds were kindly donated by Cake Stuff (see their web site www.cake-stuff.com for more photographs) and recently the community led by the village headman undertook the bridge construction. On his recent visit John provided technical support and purchased local materials. This new bridge will provide an all weather link from the village to the main road. 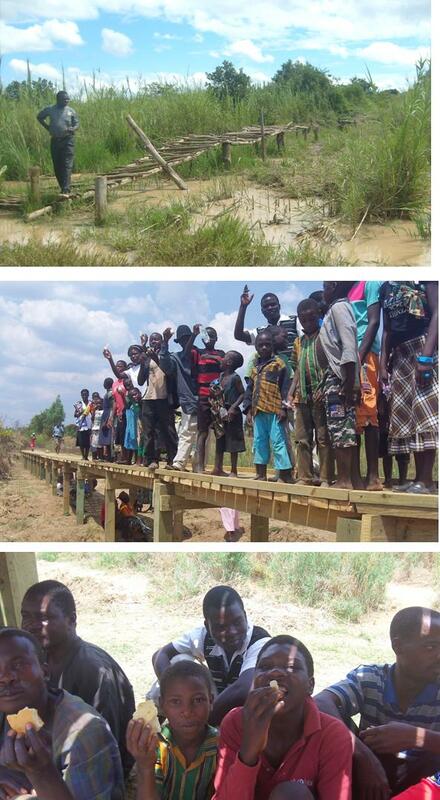 The village people are very grateful and the bridge will enable hospital visits, make daily school possible for the young people in the wet season besides opening up business opportunities. The bridge was opened before John returned to the UK amid great celebrations and lots of cake!